A stunning collection of designs focusing on the art of collaboration. A beautiful showcase of stunning contemporary designs and the ideas behind them. The manifesto at the heart of this excellent book is that collaboration matters, whether it's between different design disciplines uniting to create consistent brands, or businesses and the creatives they hire fashioning identity systems that are both attractive and effective. “Make it beautiful, but above all else make it work,” advises Jowey Roden, co-founder of London agency Koto. The shared DNA of the many, varied projects on display in Graphic Design For... is a rigorous and procedural commitment to problem-solving. Responding to questions from Andy Cooke – a graphic designer and creative director at Weather – key creatives divulge their rules of engagement with collaborators and clients. “Brilliant ideas do not come from thin air... or Pinterest...,” writer and lecturer Angharad Lewis reminds us in her foreword, but once these ideas are plucked from the ether, it takes imagination, skill and experience to transform tentative briefs into elegant brand identities and campaigns. And while strategies, techniques and theories of creative evolution vary wildly between studios, all interviewees offer equally informative insights that lift the veil from seemingly effortless solutions to reveal the powerful engines beneath. Combining aesthetics with function dominates the discussion, along with a weighty sense of the increased value of design as a vital component in the creation of new business, not just a veneer of branding to apply when the product is done. Brand building now, more than ever, is about delivering messages at multiple touchpoints. A logo may need to work on stationery, posters, buildings and animations for indents, co-exist with photography or architecture and, most importantly, continue to evolve and adapt, sometimes without the original designer involved. Mutable design systems are as vital as inter-disciplinary skills, and these projects all demonstrate tremendous flexibility. Cooke’s book also exposes the occasional angst designers may suffer when dealing with Creative Cloud-wielding clients and consumers who, when confronted by less-is-more minimalism, may be tempted to think, or even suggest, 'anyone could design that'. (We all have Microsoft Word, but does that mean we are all successful authors?) Such are the perils of beautifully refined simplicity, but the exposed workings of these projects vividly illustrate the intense experimentation that is required to achieve Zen-like design perfection. Non-designers in particular should find the (relatively) jargon-free, frank discussions illuminating. It’s almost impossible to choose highlights, as the book is itself a distillation of some of the very best contemporary design (when we spoke to Cooke he admitted that the book “could easily have been twice as long, there’s just so much good work out there”), but Hort’s iconic Nike campaign work , Studio Makgill’s intoxicating design system for G.F Smith and Freytang Anderson’s genius identity for Fraher Architects are all masterclasses in ambitious thinking and faultless execution. This is an elegantly edited time capsule of where design is now, which extracts wisdom from some of the sharpest creative minds around and is a beautiful book in its own right that can be endlessly browsed for visual and cerebral inspiration. 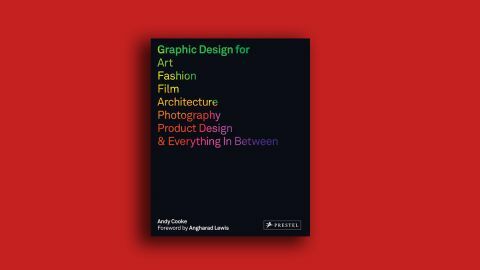 Graphic Design For... is fascinating for fellow professionals, instructive for prospective clients looking to join forces with a design agency, and utterly invaluable for students who want to learn what the industry will expect of them.